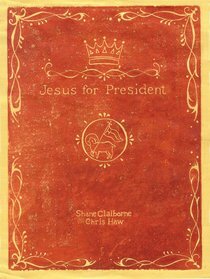 Jesus for President is a radical manifesto to awaken he Christian political imagination, reminding us that our ultimate hope lies not in partisan political options but in Jesus and the incarnation of the peculiar politic of the church as a people "set apart" from this world. Drawing upon the work of biblical theologians, the lessons of church history, and the examples of modern-day saints and ordinary radicals, Jesus for President stirs the imagination of what the Church could look like if it placed its faith in Jesus instead of Caesar. This fresh look at Christianity and culture will help you answer questions like "Should I vote or not?" and "Which candidate?" by thinking creatively about the fundamental issues of faith and allegiance. It's written for those who seek to follow Jesus, rediscover the spirit of the early church, and incarnate the kingdom of God. Jesus for President is a radical manifesto to awaken he Christian political imagination, reminding us that our ultimate hope lies not in partisan political options but in Jesus and the incarnation of the peculiar politic of the church as a people ?set apart? from this world. Drawing upon the work of biblical theologians, the lessons of church history, and the examples of modern-day saints and ordinary radicals, Jesus for President stirs the imagination of what the Church could look like if it placed its faith in Jesus instead of Caesar. This fresh look at Christianity and culture will help you answer questions like ?Should I vote or not?? and ?Which candidate?? by thinking creatively about the fundamental issues of faith and allegiance. It's written for those who seek to follow Jesus, rediscover the spirit of the early church, and incarnate the kingdom of God. About "Jesus For President Tour"